A Dooryard Garden, Using Herbs from the Colonial Period was researched and written by Rhonda Haavisto & Jane O'Sullivan, members of The New England Unit of The Herb Society of America. Throughout colonial New England, on rural farms and in small villages, the dooryard was the focal point for many daily projects. Generally sited to receive the warm southern sun, and protected by the barn and other outbuildings from bitter northwest winds, this area was used for such activities as washing clothes, making soap and candles, chopping wood and processing meat. The colonial woman's dooryard garden, along with her larger vegetable gardens, was expected to provide many of the foods, flavorings, medicines and chemicals necessary for a largely self-sufficient household with little cash. Plants such as madder and woad were used to dye cloth, southernwood and pennyroyal served as insect repellents, basil and sage improved and sometimes masked the flavors of food. Since most households were isolated from medical care, herbs such as yarrow, angelica, feverfew and valerian were used to treat common ailments or aided in childbirth. Our Dooryard Garden, as shown on the accompanying plan, was designed to demonstrate some of the elements common to a "country" garden in colonial New England and to show the range of herbs available. (While herbs here are segregated from the rest of the vegetables, colonists did not usually make this distinction, and would not have planted an "herb garden" as such.) A Dooryard Garden Plant List, which is cross-referenced by number to the drawn plan, describes each herb and identifies common colonial usage. The medicinal uses described here are those employed by the colonists; under no circumstances does the Herb Society of America recommend these plants for medical treatment. Many herbs commonly used in the 17th and 18th centuries have been found to be toxic to the liver and kidneys, while others, as noted, are poisonous. Please take care in planting and using them. These are some of the most common herbs which show up repeatedly on plant lists from the earliest days. Each of these plants was well known to colonial women. Many had been grown in Europe and England for centuries, and were viewed not only as "meate and medicine" but also as historic, cultural and religious symbols. Some kind of fencing was mandatory for all colonial gardens. Our 31/2 foot wooden picket fence would have served to keep out both wild and domestic animals. It also offers some shade to aconite, foxglove, clary sage, comfrey, herb robert, pennyroyal and violets on the south side of the garden. Our Dooryard Garden is 26 feet wide and 21 feet deep. The surrounding border bed is 3 feet wide and each rectangular bed is 3 feet by 5 feet. A depth of 3 feet is generally considered the maximum in order to conveniently work a bed which can only be reached from one side. The central pathway is 4 feet wide for ease of access to the house. The other paths are approximately 3 feet wide in order to allow room for maneuvering wheelbarrows. The plan does not show any particular material for garden pathways as colonists in New England used what was readily available. Depending on the region and financial circumstances, country garden pathways may have been bare earth, flat stepping stones, gravel, crushed seashells, or any locally available material. Geometrically shaped beds were common in colonial New England and our rectangular layout is typical of plans used throughout the period. However, the visual design of a country garden was secondary to practical concerns of topography, maximizing sunlight and access to water. Geometric beds were not always placed symmetrically within the garden plan, nor were gardens necessarily set up on an axis with the house. Colonists grouped plants with similar horticultural requirements together and we've done the same. For instance, herbs which need replanting each spring are placed in the southeast bed or in the front of the border so that perennials are not disturbed. Skirret, a perennial, is also in front as the roots were harvested each year as a food crop. The biennials and tender perennials, such as fennel, teasel, foxglove and angelica are set where they will have room to reseed. Rosemary, which is not hardy, is placed in a pot as it would have been brought indoors in the winter to enjoy the house's marginally warmer temperatures. Other plants requiring special vigilance by colonial housewives (and modern gardeners as well), such as rash-causing rue and poisonous monkshood, are placed at the back of the border. Those who are interested are encouraged to learn more about the herbs and the gardens of colonial America. The books listed below provide a wealth of information and include further bibliographies (Dooryard Garden Reading/Reference). Other sources for information include Plimoth Plantation, Sturbridge Village and Colonial Williamsburg. 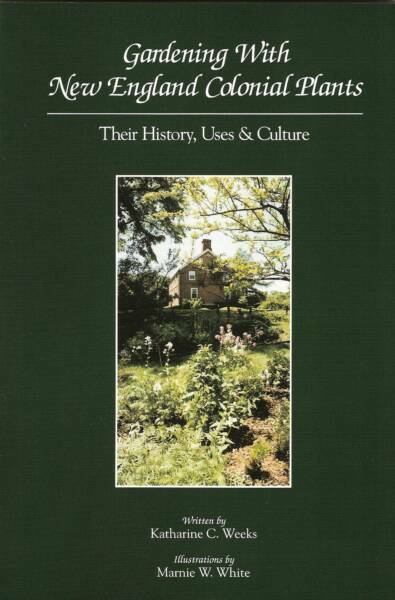 Gardening with New England Colonial Plants, Their History, Uses & Culture, by Katharine C. Weeks, is available for sale through the New England Unit of The Herb Society of America. The cost is $15 per copy which includes shipping in the continental US. We only have one or two copies left. A higher resolution scan has been added, that's easier to view or enlarge.